I still haven’t managed to find a nail artist in my area that can create some of the incredible looks people send me weekly. I have looked and, now that I have moved, I have had to start my search over. I will eventually find the perfect nail artist in my area BUT, in the meantime, I have found affordable nail decals that will solve my problem. Let’s take a look. 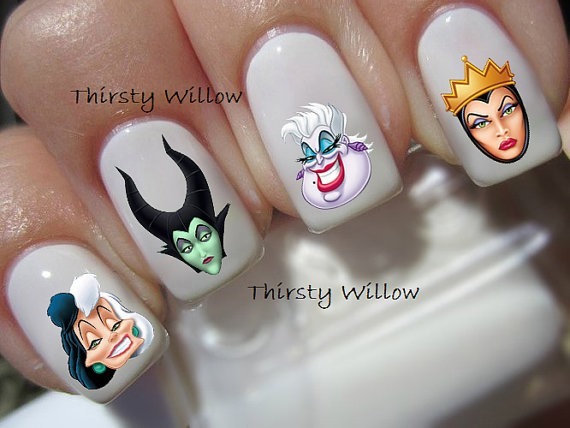 I am starting to think of my upcoming trip to Walt Disney World on Halloween and these nail decals would be perfect! They cover all the female villains and are super affordable at only $2.99! The store is very clear to let us know that the decals are clear and any part of the above picture that is white will be clear. In other words, I could choose whatever color nail polish I want and the nail decals would work on that polish, as well. I think the white would make it easier to see the decals but any color would suffice. 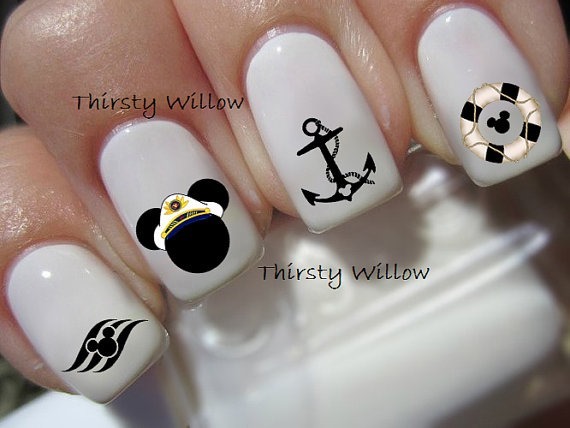 I am also going on a Disney Cruise in a few weeks and these would be perfect!! I love the subtlety, yet clearly Disney images. I think these would look awesome on a red nail…. which is probably exactly what I will do! My favorite snack on a nail! I think these are cute purely because of the fact that I love this snack. I am trying to decide which color I would put these on but I am thinking maybe a yellow?? I don’t know but I am open to suggestions. There are a ton of other designs available that you should check out if you are into Disney decals. you can find them HERE. Let me know what you think of the designs and which is your favorite. Happy shopping! Would You Wear Birkenstocks If They Were Disney?